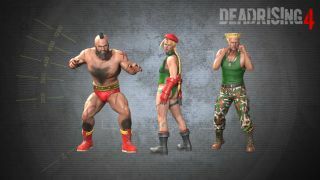 Dress Frank West up as Cammy, Zangief and Guile. Leif Johnson wasn't overly enamored with Dead Rising 4, but perhaps that's because it lacked the option to dress Frank West up as Cammy from the Street Fighter series? Such a thing will soon be possible thanks to a new update, landing tomorrow, that adds not only Cammy's iconic getup, but Zangief's gold-rimmed pants, Guile's ridiculous haircut and military garb, and a couple of other character outfits too. As detailed on the pun-tastic Capcom Unity blog, Dead Rising 4 is also getting two new difficulty modes that will arrive, likewise, on January 30. "Enemies do more damage," the post helpfully explains, "Frank’s weapons break faster and food restores less health than before. Keep your eyes peeled, watch your back, and don’t forget to scrounge for every weapon—you are going to need them". Dead Rising fans in Germany will be pleased to hear that they'll be able to buy the game at long last, as the fourth in the series will finally hit the German Windows Store on January 31. Additionally, there's a one-hour timed demo coming to Xbox One on the same date—however, it won't be available on PC.